Work styles have evolved from a hierarchical linear process into a more multifaceted structure. Cloud based interconnectivity allows for a less rigid office environment where people can work anytime and anywhere. Office design has adapted accordingly meeting the demand for a more flexible office fitout with the Activity Based Working (ABW) concept. ABW is a flexible working environment dependent on the tasks of the employee on any given day. Rather than undertake all their work in one fixed location it provides them with a choice of how, when and where to work. ABW provides different work settings dependent on the task being undertaken including team desks, conference spaces, phone areas, quiet rooms, lounges and work areas with seated or stand-up workstations. It is different from the hot desk concept or the standard open plan office by being a more customisable working environment. Design and implementation of a successful ABW fitout is unique to each business. There is no one-size-fits-all concept for ABW. Before any decision of whether to adopt ABW and how your company would benefit we aim to have a thorough understanding of how your office environment works for you and your employees. To construct a successful ABW fitout we use the 4D's approach Discover, Define, Design and Deliver. Firstly we need to get to know your business and everything that effects it. Using mind mapping techniques we "discover" your companies working model and develop broad based ideas and agree on your outcomes. This phase is vital it's where we evaluate our ideas and refine our research. What stands out? What matters most? What will work? Our goal is to "define" what we are trying to achieve and address any problems before we brief the interior designer. Skip this stage or get it wrong and the design will not be as effective as it could be. The objective of the "design" phase is to consolidate the discover and define phases into practical ideas. We illustrate the outcomes using paper plans and interactive 3d renderings. This is the final phase of the process where we bring it all together and literally "deliver" your new ABW environment. 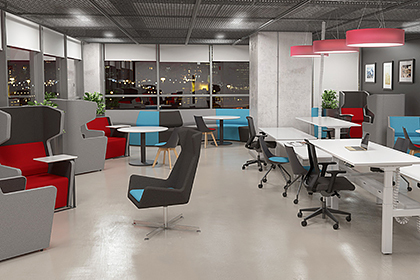 Using the 4D's ensures we create an office fitout that matches your expectations. Easier adjustment as your company grows or contracts. Does all my office need to be ABW? No, we can build a hybrid ABW and traditional office using the ABW principles in key areas or specific departments. This percentage would be determined in the discover phase of the 4D's. What is the minimum office size needed for Activity Based Working? 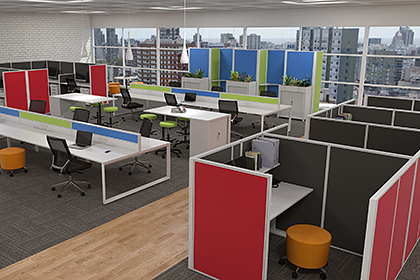 Based on our experience the minimum office space needed for a successful ABW fitout is around 300 to 400 square metres. How much does a ABW environment cost? An ABW fitout is roughly about 20% less expensive per square metre than a standard office fitout. Can we refurbish our existing office space to be ABW? Yes, using the tried and tested 4D's method ensures any ABW refurbishment of your workplace is successfully.